'Reflecting the rich maritime harvest from Canada’s cold and pristine Pacific waters, ACANA Pacifica is loaded with fresh and regional Canadian fish, wild and sustainably caught off North Vancouver Island. 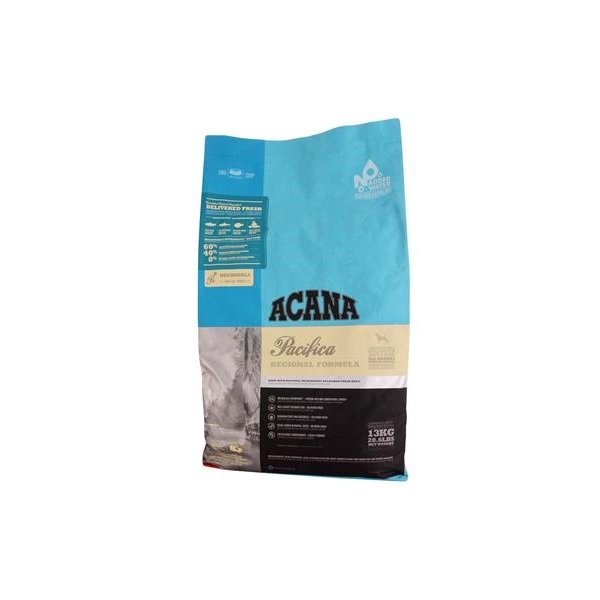 Bursting with Pacific herring, pilchard, flounder, hake and rockfish that are delivered FRESH or RAW and WHOLE daily, ACANA Pacifica nourishes your dog naturally, without long lists of additives. ACANA Pacifica features an unmatched variety of regional fish that are wild-caught by people we know and trust, deemed “fit for human consumption”, and then delivered to our award-winning kitchens fresh and whole each day! Fresh whole pacific herring (14%), fresh whole pacific pilchard (12%), fresh whole arrowtooth flounder (8%), whole herring meal (8%), pacific cod meal (7%), whole whiting meal (7%), whole green peas, whole red lentils, whole chickpeas, whole green lentils, pollock oil (6%), fresh whole silver hake (4%), fresh whole redstripe rockfish (4%), whole pinto beans, whole yellow peas, sun-cured alfalfa, cold-pressed sunflower oil, lentil fiber, dried brown kelp, fresh pumpkin, fresh butternut squash, fresh parsnips, fresh green kale, fresh spinach, fresh mustard greens, fresh turnip greens, fresh carrots, fresh red delicious apples, fresh bartlett pears, freeze-dried cod liver (0.1%), fresh cranberries, fresh blueberries, chicory root, turmeric root, milk thistle, burdock root, lavender, marshmallow root, rosehips.